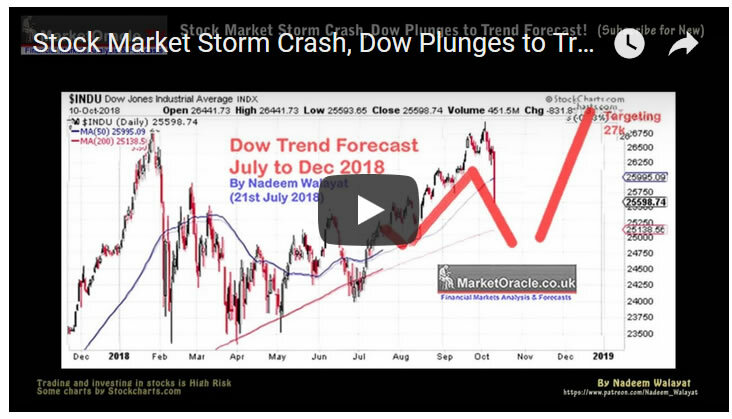 Stock Market Storm Crash, Dow Plunges to Trend Forecast! Whilst Hurricane Michael battered south east United States in the areas worst storm for decades, the stock market too was hit by a storm of selling Wednesday catching market participants by surprise as the Dow closed sharply lower by 831 points at 25598 in it's worst one day fall since February 8th when it fell by 1033 points. However, It's now nearly 3 months since I published my advanced warning of what to expect for October and the whole of the remainder of 2018 on the 21st of July 2018 that was first made available to Patrons who support my work. So to get immediate First Access to ALL of my analysis and trend forecasts then do consider becoming a Patron by supporting my work for as little as just $3 per month. https://www.patreon.com/Nadeem_Walayat. And as I stated in my previous 2 updates of 9th Sept and 26th August that I expected the then relatively stronger Dow to resolve towards convergence with my forecast rather than to trend to a higher Dow target than my forecast of 27,000 by late December 2018. Which Wednesdays price action is a confirmation of convergence towards trend forecast. Therefore, some 11 weeks into the trend forecast the Dow remains on track towards achieving it's forecast trend trajectory as the market oscillates around my trend forecast so it is not necessary for a more in-depth analysis at this point in time. 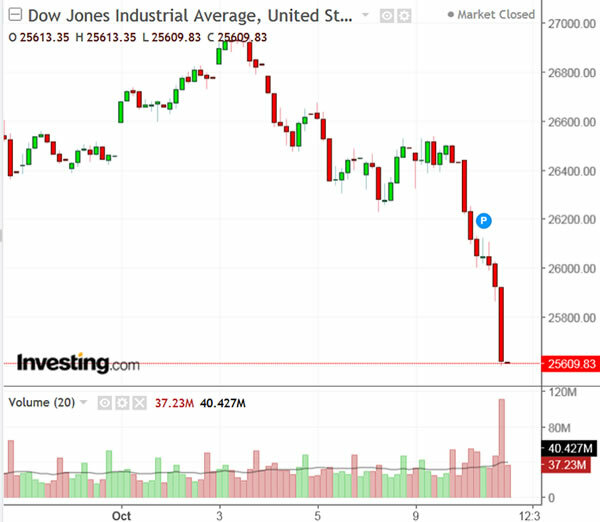 The bottom line is that the Dow currently has further to fall to the downside, and in fact it is highly likely that the Dow will now undershoot my forecast to the downside. Where I would not be surprised if the Dow trades down to 24,250. And remember to get immediate First Access to ALL of my analysis and trend forecasts then do consider becoming a Patron by supporting my work for just $3 per month. https://www.patreon.com/Nadeem_Walayat.